Before the screening, festival director Markus Keuschnigg read a letter that Shin’ya Tsukamoto sent to the audience, where he explained how making this movie was a life-long dream, how he tried to get it financed for years, and how he now believed that he simply had to do it, despite not really having the necessary funding, or he might never get around to it. And while I usually try to just rate and review the final product, in this case, I’m glad for this little background information, since it made me appreciate his effort more. Some might criticize that there are already plenty of movies that deal with the horrors of war, and I’d agree that “Fires on the Plain” doesn’t really add anything new to the genre. However, some messages are important enough to bear repeating, and I strongly believe that “War is Hell” is one of them. It’s something that cannot be conveyed often – and loudly – enough. Thus, I can definitely appreciate Tsukamoto’s intentions. There were also a couple of great, haunting scenes. For me, the “highlight” (if you can call it that) definitely was the stunning scene with the attack at night, which was just masterfully done, and incredibly brutal and harrowing. It definitely will stick with me for a while. I also really liked the quiet, haunting ending, as well as the overall sense of hopelessness, dread and despair that the movie emitted. It’s also quite surreal and nightmarish, and is more interested in conveying certain feelings that to tell a coherent story – something that, in my case, it mostly achieved. And the sometimes meditative mood really gives you time to absorb it all. Unfortunately, there also was one big drawback that prevented me from ever really getting into the movie, and that’s its cheap digital look. I’m extremely sensible when it comes to that. I’ve grown up with movies and tv-shows, and I just expect them to look a certain way. Paradoxically, while live TV is actually more realistic and lifelike, for me, a movie looks fake when it doesn’t have the typical 24fps-look (which is why I loathe HFR). “Fires on the Plain”, unfortunately, seems to have been shot with a DV-camera, which makes the movie look like the guy-next-door’s holiday video. And as much and as hard as I tried, I never managed to look past that. “Fires on the Plain” also misses a clear narrative structure, and some of the scenes and/or developments were a little too exaggerated for me. Thus, while I can definitely appreciate Shin’ya Tsukamoto’s intentions and determination, I’m afraid that I couldn’t wholly appreciate the outcome. 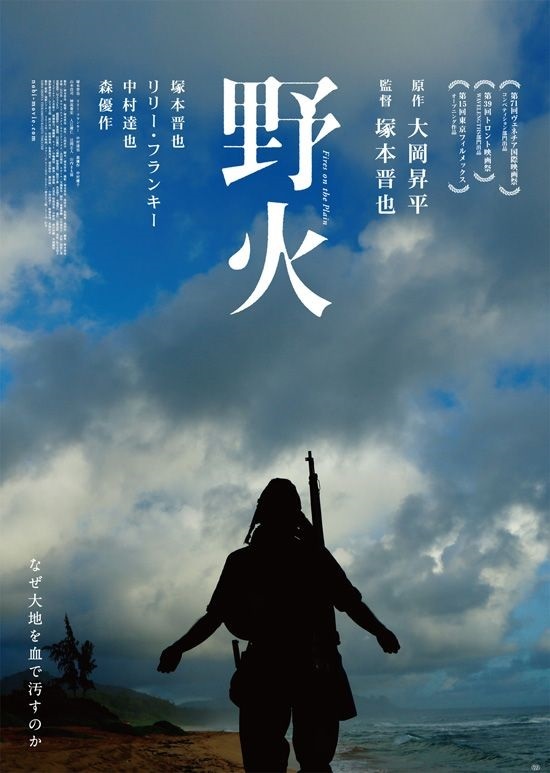 This entry was posted in /slash, movie reviews, new releases and tagged /slash, /slash 2015, drama, Fires on the Plain, japan, Nobi, Shin'ya Tsukamoto, war. Bookmark the permalink.